The barrier placement and striping will take place on the nights of 2/25/19 through 3/1/19, from 9:00 pm to 5:00 am each night. During this time, there will be alternating lane closures on the bridge. The barriers will remain in place until the northbound bridge widening is complete in approximately 15 months. 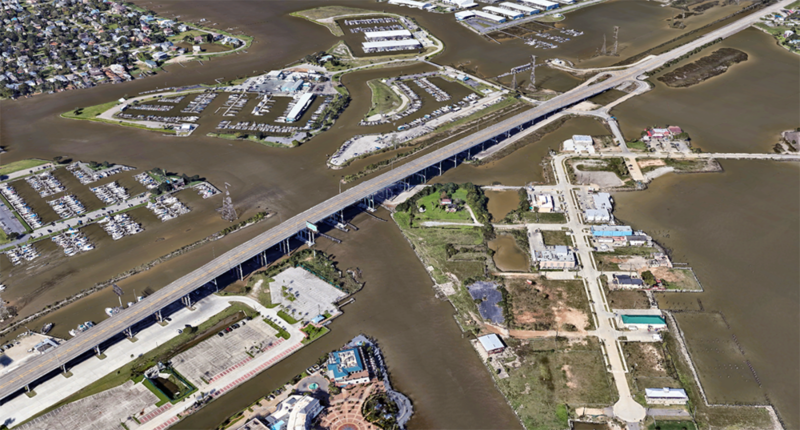 The connector ramp to Shipyard Drive (on the east side of the bridge) will be closed until completion of the northbound bridge widening. The south U-turn/access road will be fully closed beginning on 2/25/19at 9:00 pm. 3rd Street, 4th Street, and 5th Street will no longer be accessible from this access road during this closure. To reach 3rd Street, 4th Street, and 5th Street, traffic will turn east on 6th Street, then immediately turn north onto Texas Avenue. This closure is necessary for the northbound bridge widening, for utility work, and to reconstruct the access road. The closure will remain in place until the northbound bridge widening is complete in approximately 15 months.